Would you mind if this post starts on a personal note? I hope it’s okay — because here goes. This morning (Monday) I attended the funeral of my dear friend Mary Dunn. I met Mary 18 years ago. She was the instructor of a writing class I took at our local community college. Within the first several minutes of class, it was obvious Mary was a very special teacher. She knew the answer to every question, always had fantastic ideas to improve our works-in-progress, and was incredibly sweet! In fact, her two hour class soon became the highlight of my week. At our last class session, Mary kindly invited everyone to join a critique group that met at her house. 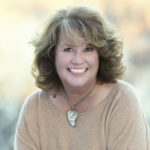 At first, the thought of joining a critique group with “real” writers intimidated me, but Mary calmed my nerves and made me feel right at home. I always looked forward to our monthly meetings at Mary’s where she even served tea and cookies while everyone took turns reading stories out loud. 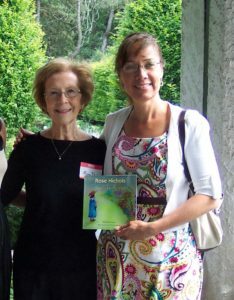 Although I had no business attempting to write a children’s book (I’m an engineer, which means I didn’t take any writing classes in college), Mary cheered me on and helped me improve my writing. Always the optimist, she kept encouraging this ill-equipped writer through dozens of rejection letters. With 30 books to her credit, Mary was an accomplished writer. Despite her busy schedule, she always made time to help others. She was my mentor, encourager, and most important — my friend. Without her, I would have given up writing. Thanks for letting me take a moment to honor this sweet lady. I’m forever grateful for her inspiration and friendship (and the lovely afternoon teas we shared in recent years.) I hope every writer (and illustrator) has the good fortune to find a kind, giving mentor like Mary, and maybe even become a mentor to someone else! So after Mary’s funeral, I decided to go to the library to find a book to feature in this post. I hadn’t had time to select one yet due to editing deadlines and recent “life” happenings (my daughter left home this morning to move to Arizona). I also hoped spending time at the library surrounded by children’s books would help me feel less sad. 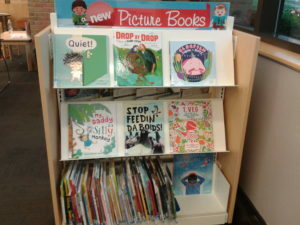 As always, the “New Picture Books” cart was filled with fresh, beautiful titles. But I didn’t see quite what I was looking. Not today anyway. So I asked the children’s librarian if there were any recent picture books she particularly enjoyed. She immediately stood up from her desk and told me to follow her. “I’ve been showing this book to everyone. 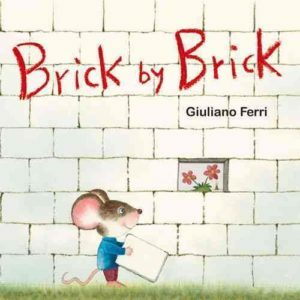 It wordless, and it’s wonderful,” she said, handing me a small book titled BRICK BY BRICK (by Giuliano Ferri). I was hoping for a book with text, yet the librarian’s enthusiasm made me curious. The cover was adorable! And the clever cutout on the cover which revealed a flower inside caught my eye. So I sat down and slowly turned the pages. Eleven spreads later, I understood the librarian’s zeal. Without a single word, this tiny book shared an inspiring story of helping, kindness, and hope. Its message of kindness and hope seemed to be just what I needed. And perhaps it’s what our world needs too! board book, brick by brick, Giuliano Ferri, hope, Mary Dunn, mentor, wordless. Bookmark. Brick by Brick sounds lovely! I’m sorry for your loss, Mary sounds like a wonderful mentor and friend! What a precious post and adorable book cover! Thank you for sharing your heart! I am also in need of a little pick-me-up, and the book’s cover (adorable!) and what you said in your last three paragraphs have convinced me to put this book on my list. Thank you for sharing. Lori, hope this book makes you smile and tomorrow is better! 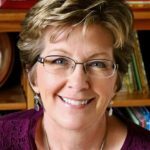 Suzanne, what heartfelt post! I have era many of your books and so appreciate them. May we all be blest with a mentor/friend like Mary. Mary was truly a gem. I feel blessed to have known her for so many years! What a lovely tribute to your friend, Suzanne. Mary sounded like a true gem. Thanks for sharing this with us, and for the book recommendation. We could certainly use more bridge-building and less wall-building. You’ve inspired me, Suzanne. I’m going to try my hand at a wordless PB! My thoughts are with you, Suzanne. Thank you for sharing about Brick by Brick. I’ll put it on my library hold list now. Thank you for sharing your heart. What a treasure you had in your mentor; and I sense she will always be with you because she is in your heart. Can’t wait to look at the book. Brick by Brick is on my list. 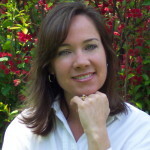 Thank you, Suzanne, for introducing your blog’s readers to the very special Mary Dunn! She packed a whole lot of Smarts, Kindness, Caring and Spirit into that diminutive body of hers. You are just one of many writers whose careers she launched and cheered on. Those of us who knew are oh, so luck! She really was one of a kind Esther! I count my lucky stars I knew her for so many years. She felt like family! Thank you for sharing this today. You’ve given me hope which is a great gift to receive. Hope really is a powerful thing. Glad this post gave you some Danielle! What a wonderful tribute to Mary! I only met her a couple of times, but she was very sweet! Thank you for sharing this heartfelt post. I can’t wait to read Brick by Brick – sounds wonderful and much needed! So sorry for you loss! Mary sounds like a wonderful mentor and friend. This book looks adorable! I will have to look for it. Suzanne, what a lovely, heartfelt tribute to Mary Dunn. I know she was one special lady. Thanks so much, Suzanne. I still can’t believe she’s gone. How lucky I was to have had her as my mentor, too. She leaves a legacy of having inspired and enriched so many lives! I have such great memories of us at her book launch. Doesn’t she look adorable in that photo? I think we first met at Mary’s house! Lovely tribute, Suzanne! I wish I had known her – it sounds like she influenced and shaped many debut writers on their journey to publication! Great lady. How lucky you were to have a mentor like Mary, whose words and support will stay with you forever. Brick by Brick definitely sounds like a book the world needs right now! What a heart-warming post. Thanks! What a lovely tribute to Mary! Thank you for sharing your memories, Suzanne. I took Mary’s CLC class, too. She was a gem; a truly kind and giving spirit. Your memories of her match mine. So glad to have known her. This is a beautiful tribute! However, I’m devastated by this news. Mary and I were in a very small critique group together for several years, and we only lost touch in the last year or so. Has she been ill? I’m sorry I did not know about the funeral yesterday, as I would have gone. Please contact me! I’m so sad to learn this. Such a lovely tribute to your friend and mentor. This book sounds wonderful. It’s now on my list to read. Thanks for sharing. This is so lovely, Suzanne. Makes me wish I’d known Mary, too. I’m sorry for your loss, Suzanne. Mary sounds like an amazing mentor and writer. I’m sorry for you great loss. Mary sounds like she was someone very special. A lovely tribute, Suzanne. If only we all had a mentor–and friend–like Mary.